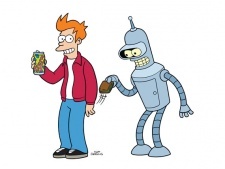 A promotional picture of Fry holding a Slurm can as Bender steals his wallet. The relationship between Philip J. Fry and Bender Bending Rodriguez is a recurring theme on Futurama. They are often called best friends. Both have also performed acts of extreme loyalty. When Bender was lost in space, [3ACV20] Fry broke into a monastery to commandeer their space telescope, saying, "You guys have forever to look for God. All I'm asking is one measly lifetime to find my friend." Bender: Shinier than yours, meatbag! This list should include all media mentioned above. This page was last edited on 13 June 2017, at 19:46.